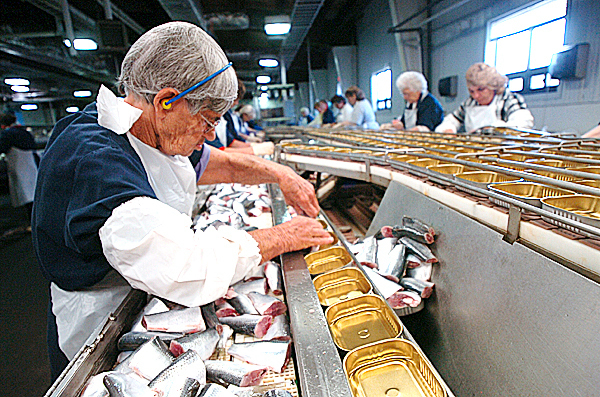 Lela Anderson packs herring on the floor at Stinson Seafood in this Oct. 17, 2006 file photo. 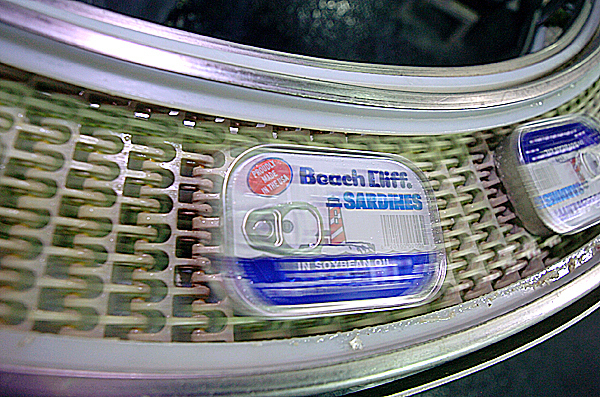 Anderson has been packing sardines for more than 50 years at the plant. Sardines packed in soybean oil fly down the line at Stinson Seafood in this Oct. 7, 2006 file photo. 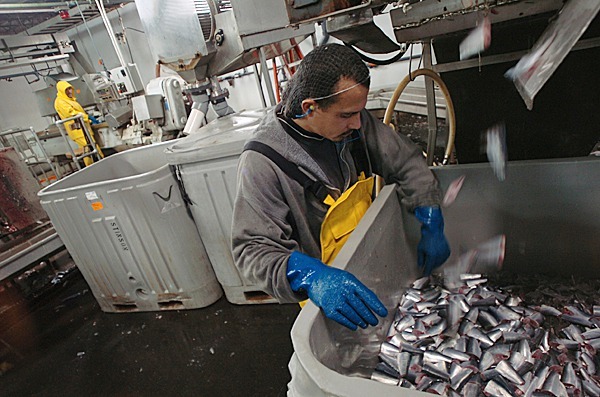 CAPTION Sardines packed in soybean oil fly down the line at Stinsons Seafood in Prospect Harbor. 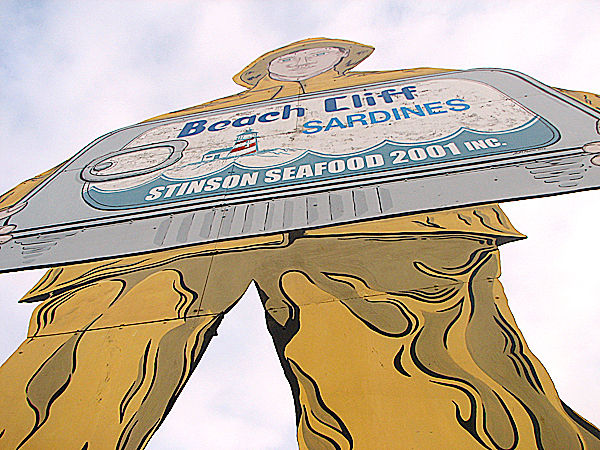 The tall Stinson Seafood cannery plant sign looms into the sky in Prospect Harbor. GOULDSBORO, Maine — Workers were shocked Wednesday when they were told that the last remaining sardine cannery in the United States would close down for good on April 18, ending more than 100 years of local history. Bumble Bee Foods, which acquired the former Stinson Seafood plant in 2004, made the announcement Wednesday afternoon to employees at the facility in the village of Prospect Harbor. With the closure, 128 people are expected to lose their jobs. Melody Kimmel, a spokesperson for the San Diego-based Bumble Bee Foods, confirmed the announcement Wednesday. Kimmel said a reduction in the federal limit on herring was the main reason behind the company’s decision. In 2004, the federal limit on Atlantic herring was 180,000 metric tons, but this year it is only 91,000 metric tons, she said. With such catch restrictions, the plant is no longer economically viable, she said. Click to watch ‘The Last Cannery’ photo slide show (2007). “Where it stands now keeps us from production levels that would ensure the plant’s long-term viability,” Kimmel said. Workers who are losing their jobs are expected to receive severance pay and job placement counseling from Bumble Bee, according to Kimmel. The plant has been operating in Prospect Harbor for more than 100 years, Kimmel said. She said there are other seafood processing plants in the country that can herring — which are called sardines after being processed and canned — but that this facility is the last one in the country that deals solely in sardines. Kimmel said that, as a result of an anti-trust case brought against Bumble Bee predecessor Connors Bros., which bought the plant in 2001, Bumble Bee inherited a consent decree with the state that required the company to keep the plant open through the end of 2010. She said that, given the state of the herring quota, the company was asking for a waiver from that agreement. Despite concerns about the reduced herring quota and the overall state of the economy, workers at the plant and residents said they were surprised by the news, which is the second significant closure of a local employer in the past decade. In 2002, after it had been announced years before, the Navy closed a base in Gouldsboro and at nearby Schoodic Point where at one point 1,000 military personnel and their families were stationed and where more than 100 civilian employees had jobs. Workers outside the plant late Wednesday afternoon said the announcement hit hard when Bumble Bee officials broke the news to employees. Some were reduced to tears, they said. Reinaldo Perez-Chamarro, 35, of Gouldsboro, who spoke little English, was visibly upset by the news. A six-year veteran of the cannery, he held up a piece of paper from Bumble Bee that said the company may have other positions available at plants in California, Puerto Rico and New Jersey. He said he didn’t want to move. “I have two babies, payment on car, payment on house,” Perez-Chamarro said. Eric Deacon, 31, of the village of Corea, said he took a full-time job at the plant about a year ago so he could get away from seasonal work. He said he doesn’t have a family to support, but that many employees at the plant come from families with parents and grandparents who worked at the plant before they did. Rice, the town’s first selectman, said that the eventual closing of the plant was inevitable, given the current economy and the slow disappearance of the once-common sight of sardine canneries in Maine and elsewhere. But he said the news Wednesday still came as a shock. It’s not just the employees at the plant whose finances will be affected, according to Rice. Several businesses on the Schoodic Peninsula counted daily on plant employees to be their customers. For the town, the plant closure likely means a loss of about $125,000 in annual property tax revenue, he said. “It’s going to have a huge impact on all these things that make up a community,” Rice said. A lobster dealer by trade, Rice said that the reduction of the annual herring quota by the New England Fishery Management Council surely deserves much of the blame for the plant’s demise. 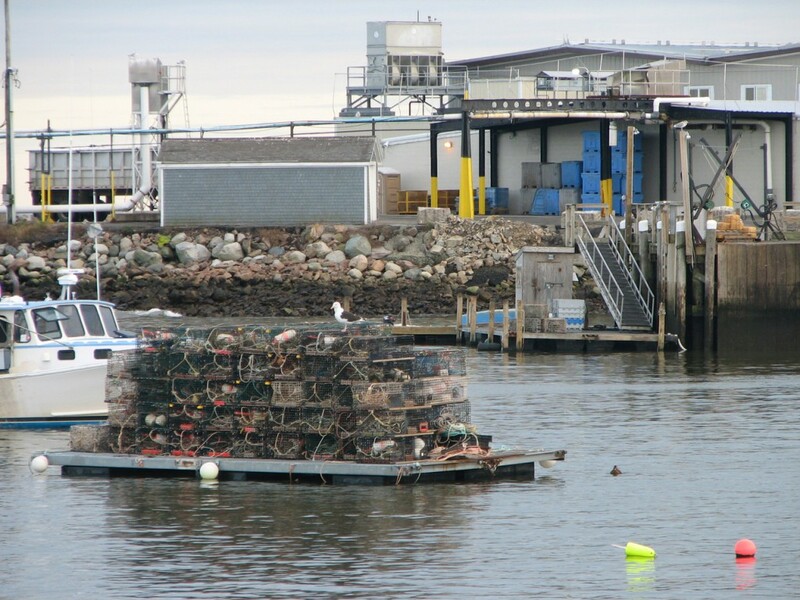 But even if federal regulators reversed their decision, as they recently did with a proposed tightening of scallop restrictions, it would be too late to save the plant. Gov. John Baldacci and U.S. Sen. Olympia Snowe released separate statements Wednesday saying they would work to provide state and federal assistance to the laid-off workers. Snowe said she had received assurances from Bumble Bee last fall that the company planned to keep the cannery open. “This sudden reversal of that commitment without any advance notice or effort to work with us to help steer this situation toward a more favorable outcome is inexcusable,” Snowe said in the statement.